We love nothing more than a DIY tutorial that helps us recreate something beautiful that we definitely can’t afford the original designer version of! That’s why we were so pleased to discover this guide to remaking a set of beautifully fluttering Anthropologie curtains, expertly laid out by Kojo Designs. We adore the way the petals look as thought they’re floating slowly to the ground, especially when the sun lights them from behind the curtains. Do you have a set of white curtains that are doing their job just fine, but that you’ve kind of lost your interest in because they’re so plain? Try dip dying them! Besides being surprisingly easy, dip dying is very trendy right now. 4 Men, 1 Lady shows you how to use the technique to add an awesome pop of colour, or at least a contrasting shade, to your window area. Are you looking for a window display that makes a little bit more of a statement but doesn’t add any colour to your current decor scheme? Ruffles are the perfect compromise! We life the idea of this heavy burlap material because it bears a more solid presence in the room than, say, chiffon, which would blow lightly in the wind and blend into the surroundings. Check the design out on The Caldwell Project. 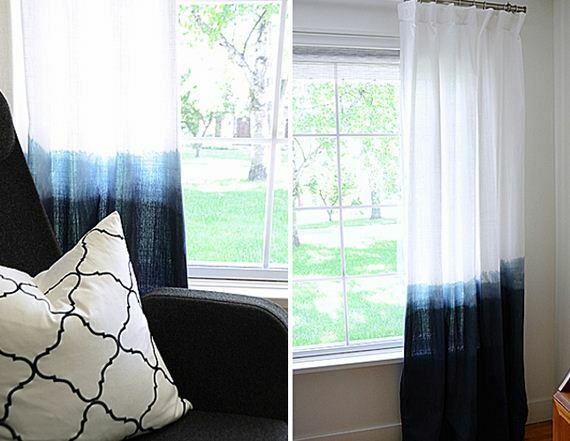 Are you looking for a quick way to transform some plain white curtains you already have, but dip dying isn’t really your style? Try painting some bold, solid stripes instead! 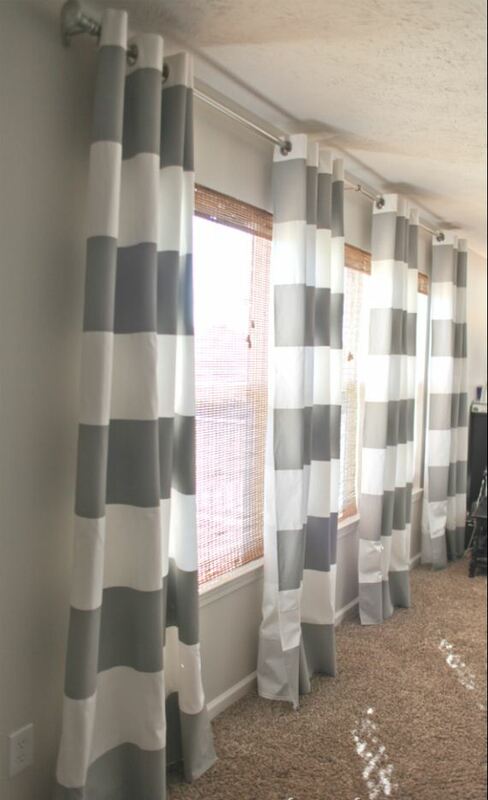 We love the neutral beauty of these gray ones by Infarrantly Creative, but you could paint your stripes any colour you choose. 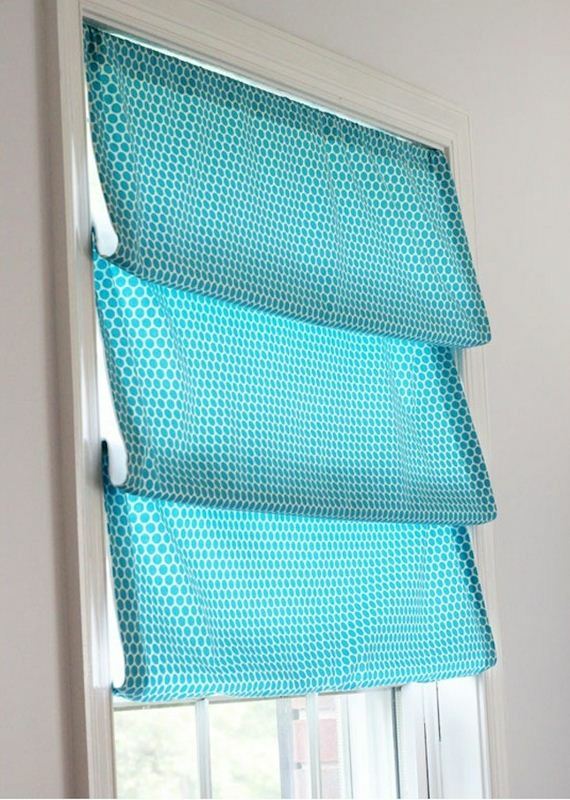 Are you you looking for a little bit more than just a new set of curtains? 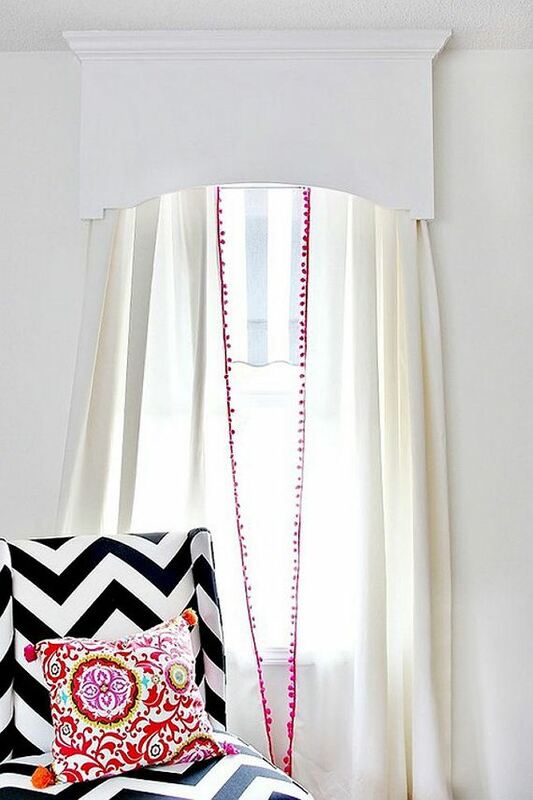 Well, Thistlewood Farms does suggest updating your curtains a little bit by adding bright, adorable pom poms to the inside edging, but they also guide you through the process of making a decorative cornice board! Paint your version if you’d prefer a little more colour than what you see here. We’re working on our sewing skills but we’re not quite there yet when it comes to taking on complete sewing projects, so we’re always rather pleased when we see a nice design that says “no-sew” on it. 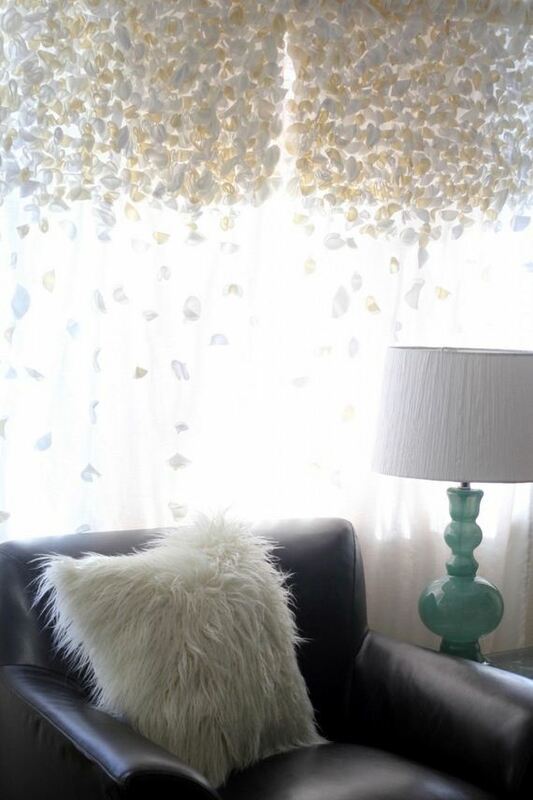 These tiered Roman shade idea from In My Own Style is a perfect example! It’s also a great opportunity to inject a little bit of colour and pattern into your space. Do you like the idea of adding more than just curtains but the cornice board above isn’t really your style? Maybe you’d like something a little more rustic chic. 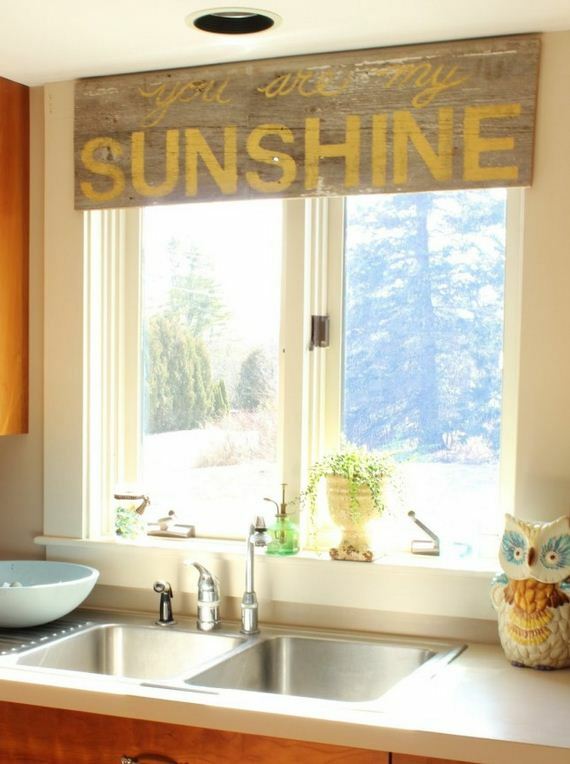 In that case, this creative wooden valance made, painted this this adorable quote or another of your choosing, might be a little bit more up your alley. Check out how it’s made on At Home on the Bay. Have we mentioned that we love upcycling? Well, we really do, and your window display is a great place to make some happen. 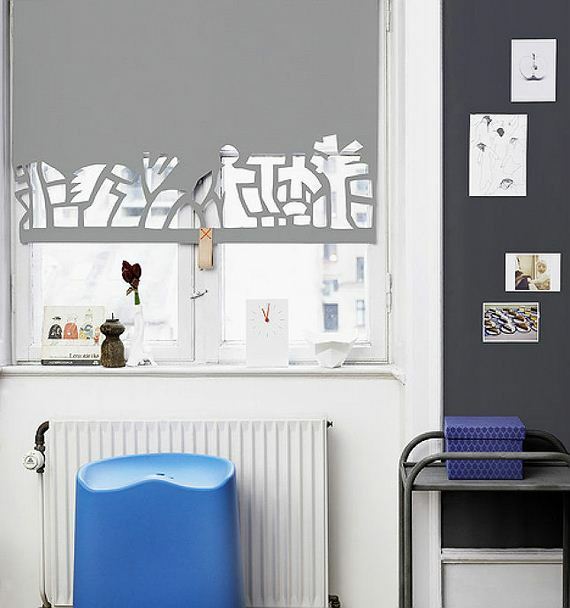 This adorable window top shade, for example, is actually made from an old fitted bed sheet. If you have a set that’s lost its elastic but has a colour or pattern you enjoy that hasn’t faded yet, then you’re basically in business! Check out how it’s made on In My Own Style. Perhaps you live in a gorgeous old house on some property and you’ve done your best to establish a bit of a vintage farmhouse aesthetic throughout your rooms? 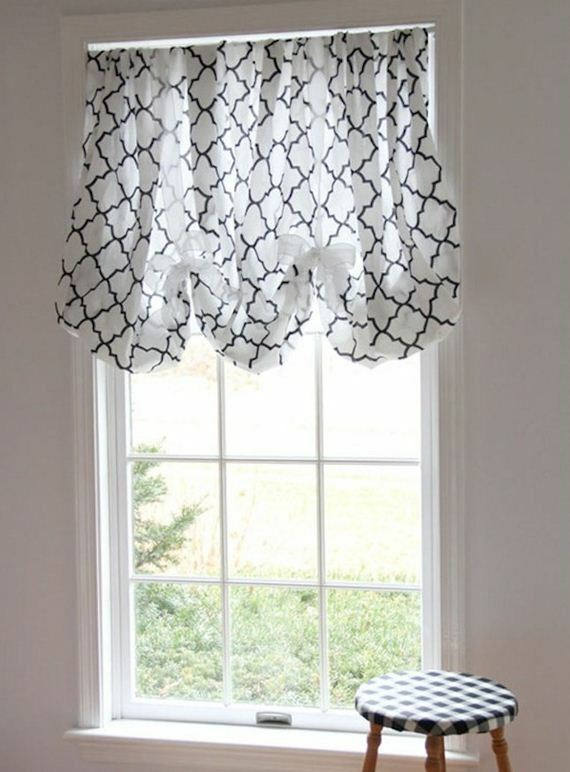 Then a set of delicate curtains might not be your best bet for decorating the windows in your kitchen. 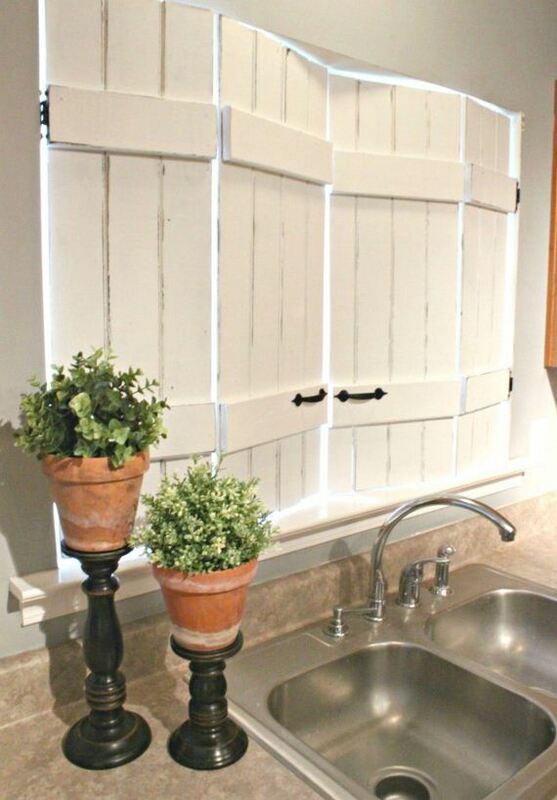 Instead, try revamping a set of old wooden shutters from a yard or farm sale! Check out the steps for putting them up in your own window on Vintage News Junkie. There’s that friendly “no-sew” term again! 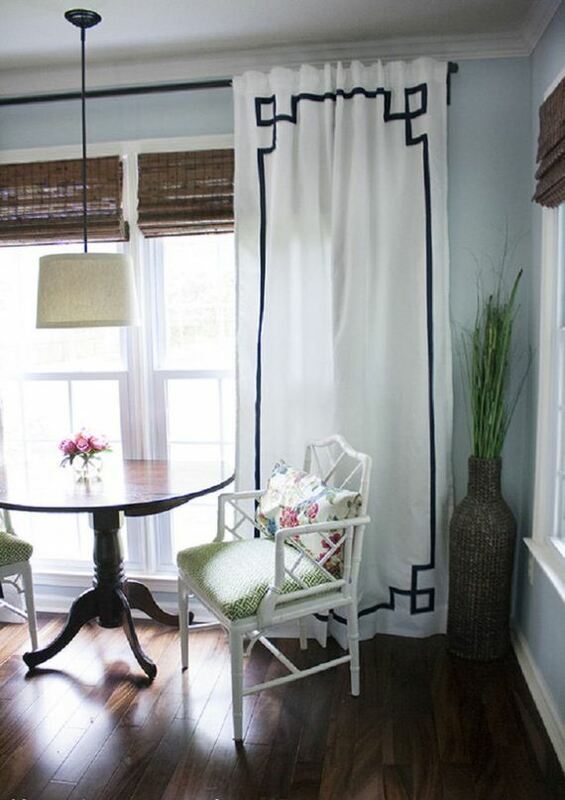 We love these curtains as a DIY option because they’re very simple to do, and also very simple looking, and yet we find them completely visually pleasing. That’s a rarity that we appreciate! View Along the Way shows you how they’re made. If we’re being completely honest with you, we’re pretty sure this project is our favourite one on the entire list. 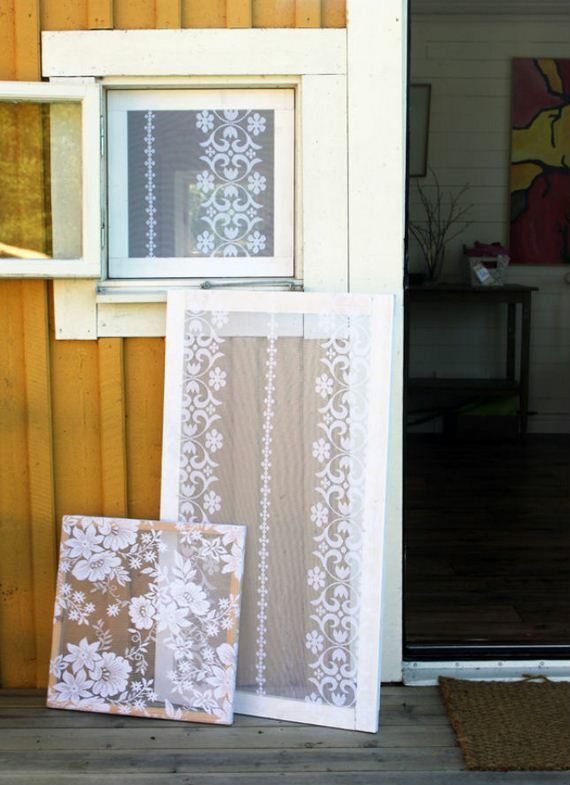 Instead of just leaving the regular screens in your windows, replace them with lace! Remove the screens and wrap the lace around so it pulls taught. Replace the frames in the window and enjoy the way the sunlight shining through creates floral lace patterns across your floor and furniture inside the house. Check the whole process out on Design Madde! The ideas on our list so far have been wonderful, but none of them have really been explicitly kid-centric. Sure, a few of them could go in a ruffle-filled little girl’s bedroom, but what if that’s not the style of your nursery? 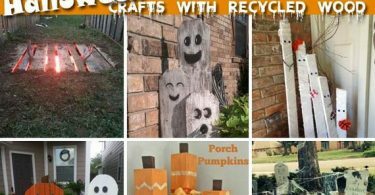 Check out this cut out blind idea instead! BoligLiv shows you how to create simple silhouette images using negative space. Do you like the ruffled design you saw further up on the list but you’re not sure having quite so many ruffles from floor to ceiling suits the aesthetic you’re trying to build? There’s always room to compromise, and Maison de Pax has you covered for a design that might be a little bit closer to what you’re looking for! 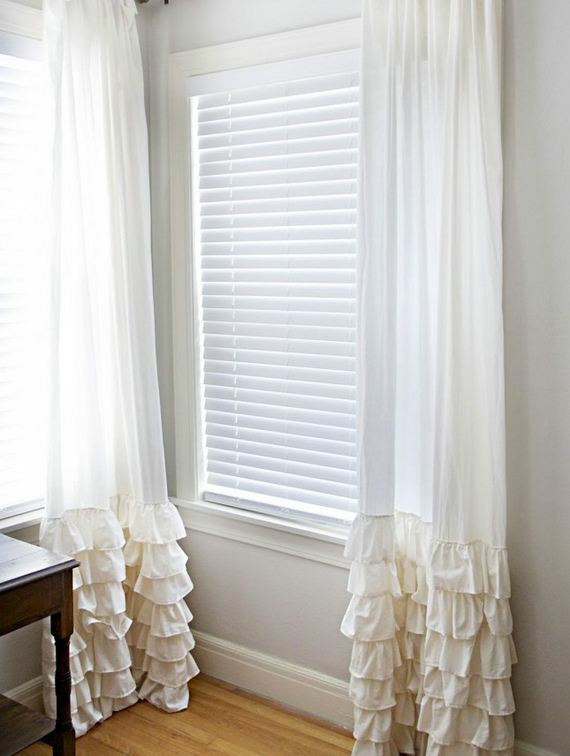 We love the way the streamline fabric at the top of the curtains contrasts with the layers and layers of ruffles near the floor. Have you found a set of tea towels that’s so pretty you can hardly bring yourself to soil them by actually using them in the kitchen? You can still put them to good use. 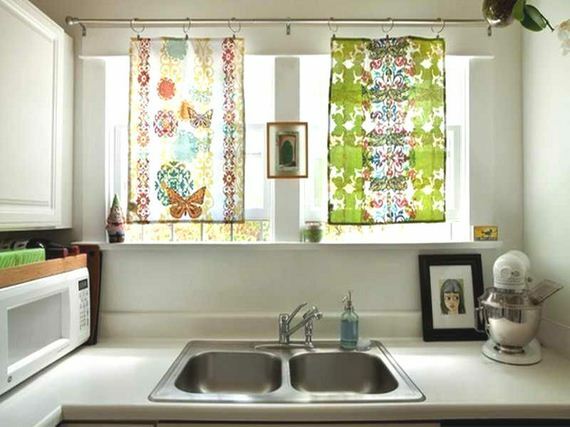 Display their beauty for all to see by transforming them into a little kitchen window curtains! 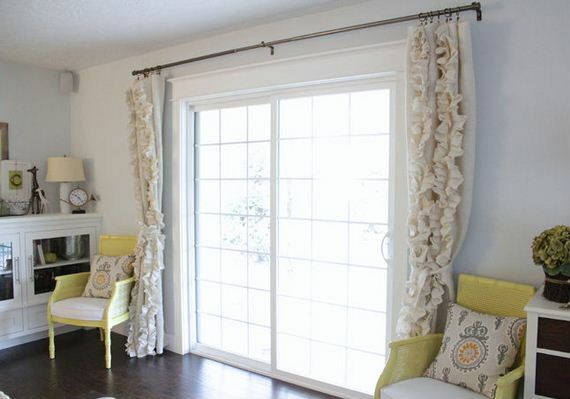 Clips and rings around a curtain rod will help your hang them without ruining the towels you loved so much. 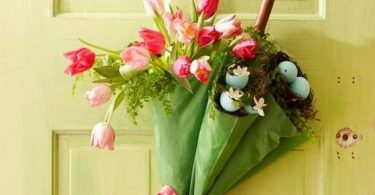 Check out how these ones were hung up on The Kitchn. 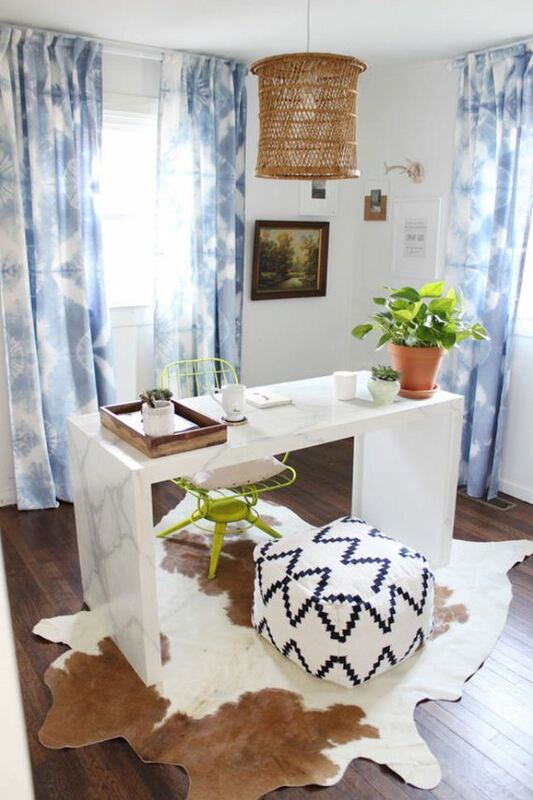 When you think of a pattern that you’d like to include as a primary part of the decor in a main room of your house, your mind might not go right to tie dye. Usually, tie dye includes many colours and a pattern that is super fun, but verges on obnoxious if it’s featured too heavily. The White Buffalo Styling Co., however, reminds you that tie dye can also be done in more sutble shades that look quite lovely and don’t overwhelm the rest of your decor! This pale blue is a lovely example.